Vintage blouse, skirt, belt, purse, and jewelry; Shoes by Fioni. 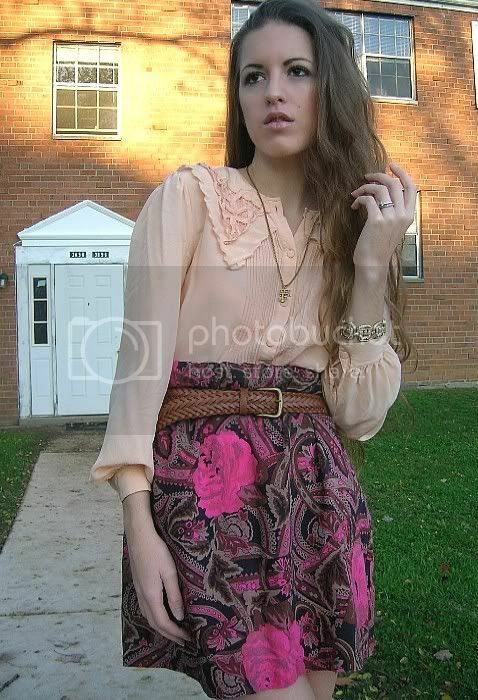 Love the vintage blouse - looks lovely with the skirt! i love your blouse! beautiful! I like the Dolly inspired look. That bag contrasts well with the colours of the skirt and blouse while still being complimentary as a whole outfit. Really cool. the whole ensemble is lovely!! I love your skirt and your bag, great outfit! i love everything!the skirt and the bag is amazing! thats my style i love!! You look georgous!!! Girl , you look beautiful !!! Love the entire outfit, but especially the skirt and blouse..
Great outfit! Thanks for the comment, by the way...I'm pretty torn on the boots, but am leaning toward the first ones! Hope you can follow my blog! This outfit is adourable!! I love it! Love that skirt, it's adorable! I love whole combination of the floral skirt & the green bag how it shouldn't go yet it does :), never been on your blog before i like it !! oh wow I think the color combination turned out fabulous!! Adore the print on this skirt!! You look completely wonderful from head to toe! Vintage everything! Yay for you. I've become a thrift shopping fiend lately, it needs to stop. You look absolutely amazing and I love the selection in purse color -- nice little touch! hot hot hot. i am loving the pairing of these colours!